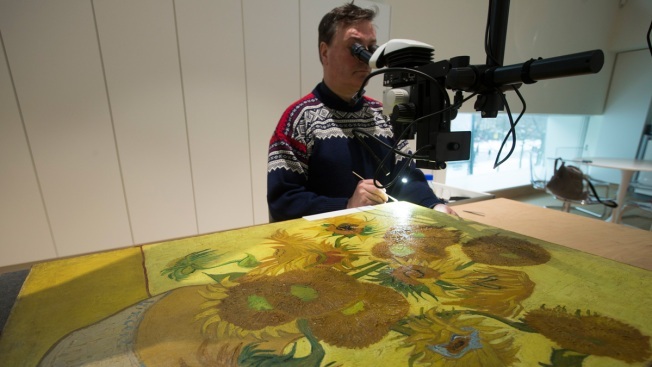 In this photo taken on Wednesday, Jan. 23, 2019, senior paintings conservator Rene Boitelle works on restoring Vincent van Gogh's world-famous "Sunflowers" painting at the Van Gogh museum in Amsterdam, Netherlands. The painting will remain in the conservation studio for another five weeks to complete the final phase of comprehensive research into the condition of the work. The painting will also be restored in order to ensure that it is preserved for future generations in the best possible manner. A "full body scan" carried out on the Van Gogh Museum's version of the Dutch master's iconic "Sunflowers" has shown the painting is not fit to travel because it's in "stable but vulnerable" condition, the museum's director said Thursday. 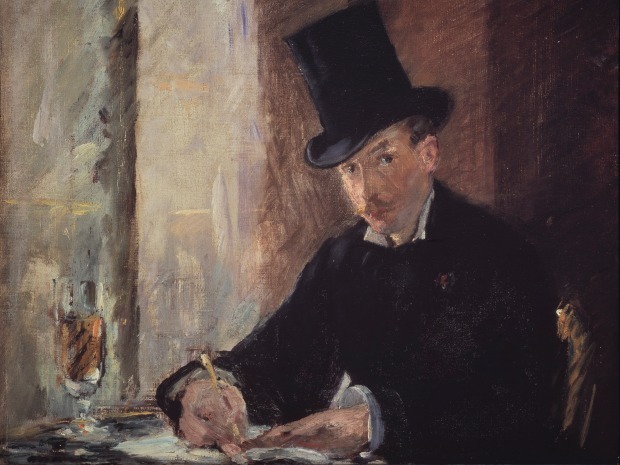 "We've decided that any stresses that the picture could be subjected to were it to travel, were (it) to be lent, that those might be too risky," director Axel Rueger told The Associated Press in the studio where the painting is undergoing restoration. "So therefore we decided that from now on we will not be able to lend the picture anymore to other exhibitions to other museums — so it will always stay in Amsterdam." For Van Gogh fans who can't make it to Amsterdam, the predominantly yellow 1889 painting of a bunch of sunflowers in a vase is based on another version of the work painted a year earlier that is on display at London's National Gallery. Other versions of the work are in Philadelphia, Tokyo and Munich. The painting in Amsterdam is hardly a frequent flyer — it has only been loaned out six times, the last time to the National Gallery so it could hang next to that London museum's version. Ella Hendriks, who worked on the current restoration project, said the painting underwent a series of tests she likened to a "full body scan" on a human patient. The tests used precision imaging machines to peer through the surface and decide what could and could not be done to the painting. One test, usually used to examine retinas, gave a crucial insight by creating a "virtual cross-section" of layers of paint and varnish. "We can see ... that the paint layer is mixed in together with the varnish layer so there's not a clear division between them," Hendriks said. To return the painting to its original state would involve removing the varnish, which Van Gogh did not apply to the painting. Also, some previous restorations are under the varnish and can't be treated. "That varnish cannot be removed safely - at least not with the methods and materials available to us now," Boitelle said. 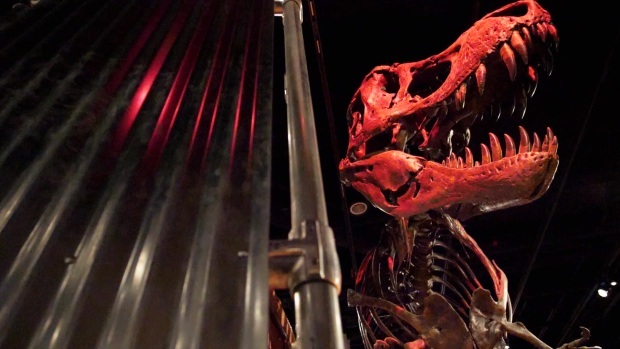 "I can remove the wax but the retouchings are there to stay - at least for now." That means Boitelle has just a few more weeks to incredibly carefully spruce up one of the world's most recognizable artworks. "It's quite exciting, obviously, but I try not to be too aware and too conscious of all the myths and the iconic value that the painting has," he said. "After all it's still just a painting like so many we've treated here in this studio and I'll treat it with the same dedication and seriousness and concentration as I would treat any other painting that is not iconic."